You have probably noticed the American flags that are placed around the circle at Freshfields and at the Kiawah and Seabrook entrances for major holidays. 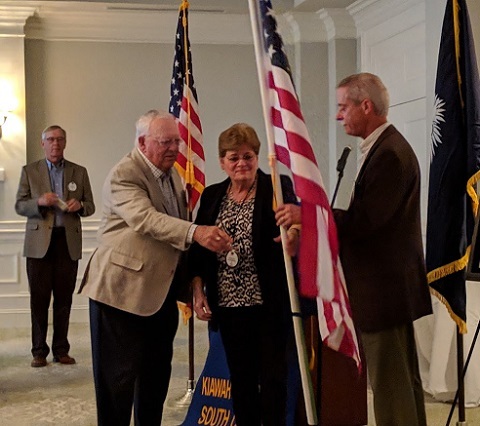 The Kiawah-Seabrook Exchange Club does that for our community, and Exchange Club member Jim Bannister is one of the leaders of the effort. You might not know that Jim also conducts a tribute to “Fallen Heroes” at every Exchange Club meeting. The Fallen Heroes are South Carolina natives who gave their lives during the War on Terror. He researches the story of each one and finds suitable photos that are displayed during his comments. Every flag displayed by the club on holidays bears a yellow ribbon with the name of one of these fallen heroes. On Wednesday evening, March 21, Jim and his wife Marlise were honored with a very special flag for a very special fallen hero. The yellow ribbon on this flag is in honor of their own grandson, Sergeant First Class Zachary Alan Bannister, of Sanford, SC, age 33, who died on October 17, 2016 in Kenya, and it’s a replica of the flag that’s among those displayed on holidays in our community. Jim and Marlise remind all of us of the sacrifices made by Americans in defense of our country and our freedom. It was our privilege to honor their grandson with a flag that bears his name.